I really need to get back into working out. I used to enjoy it so much but now it seems so hard to find the time. I know it really isn’t, I just need to get focused like you! You Look great keep up the hard work! Thank you for sharing. Hokey smokes, if I could do ONE pushup punch I’d be oh so forever happy. I think that one would really work some muscles I need to work! You put this post together in a great way. It’s easy to skim through and understand what the work out is about and the gifs are a great added feature. I love the cute workout gear! You are very inspirational and I need that motivation sometimes. I love seeing what you are doing and modifying the exercises for myself. I’ve never heard of HIIT workouts, but they seem really effective. I don’t think I could do everything, but I kind of want to try! This looks like an AMAZING workout! I have never done a HIIT workout before but it looks like it would seriously work you out!! Great workout. You make it look so easy. I would love to try it. I’m DEFINITELY going to try this workout. I NEED to get in shape! Not there yet, but this post is a motivater! This is awesome. I’m still not ready for floor workouts yet but I am saving this in my bookmarks for when I’m ready. I heard that the HIIT workouts are short and effective. Thanks. I love doing Bridge booty lifts- although my chiro called them Pelvic tilts when he taught me them lol. They actually help me keep away a back injury I got from a car accident so I do them almost every night! You look great! I love these exercises. They’re simple, yet effective for me. I have been awesome at working out these week! I need to try this one! Looks like a great workout. I love how you demonstrate each move. Those pants are awesome with that pocket! Need them! wow, these are awesome techniques! I would love to try the booty lifts. These are great and wow gorgeous. I need to focus on more cardio! You are so inspiring! Thanks for sharing your workout and the details on your cute workout wear! You’re so fab!! Cardio makes my heart strong, this is very helpful thanks for sharing us. She makes this look super easy. I need to try a few of these. You look AMAZING, girl. I need to do something. This is inspirational. Chanelle you body is ripped! I am so jealous and I need t o cut out your picture and put in on my vision board! You look good!! I love those spunkwear capris too with the pocket! I think I can do those moves. I always look forward to your Wednesday workout moves. My daughter has been trying to get me to do tabatas for a long time because s them in gym class Now I understand what she wants. OK NOW..I’m motivated. I can’t do HIIT yet. But I’m gonna get there. Love the pants too. That pocket would come in super handy. Yup! I do all those! But funny enough, I don’t look anything like her! lol! I love the pocket on those pants! Great workout! I have not seen those pants that hold the phone, I need a shirt that does that, it’ll come in handy! Not only do you look awesome, but you share such helpful workout tips! The Booty Bridge is one I need since my bottom is no where near as amazing as your’s! I feel like I’m getting a free trainer! It’s awesome! Great work out! I need to do this! Some of it i do in my pilates classes! I like how HIIT workouts gets the job done in such a short span of time. You also have a great outfit here. Your work out wear is awesome, looks so comfy which is exactly what I need and would maybe help me more. I wish I had your strength and your passion. Thank you so much for these workouts. I may not finish them the first time through, but I keep going back. Cah-yute work out gear, especially the built-in pocket in the capri’s! Love those shoes, too. Wow! You look great! I need to try this out. I love those pants! They are super-cute and perfect for my morning walks! I’ll have to check them out! Argh, I bet I can’t do some of them haha. But great workouts to perform at home. Thanks for sharing. I have a love/hate relationship with mountain climbers. haha. I absolutely hate doing them, but they work so well! No effort, no gain I supposed. Thanks for sharing! i think I’m in the same relationship with them. It’s mostly the but we are trying to work it out. First time on your site– whoo girl you like great! I love how you outline each of the exercises in a non-video format. I often get discouraged by having to watch a whole youtube video first before starting, but I love how this is laid out! Welcome friend! Glad you dig the gifs! It looks like intense workout but I think I can do this!!! I love your workout outfit too!! Wow. What an intense workout. My muscles were aching while I was watching it. I hope I can still do this stuff but my old body would be screaming in pain. haha. I would do my regular walking and probably stretching too. Cardio workouts was really important and good exercise for the heart, I think i need to try it for the healthy heart. This workout seems rather intense! I hadn’t heard of high intensity interval training before. Great information I think it’s time for me to try to get back in shape. OH my gosh, this sounds exhausting but super effective! This looks like an intense workout! I just got back into fitness so I would need to ease into that! I love your workout outfit. This is an intense workout, but I think I could do this. This is the first time I’ve heard of the Tabata timer, though. I need those pants! My yoga pants have no pockets, and the one pair I have that have pockets are super shallow so if you sit down with your phone in your pocket, it comes popping out! Oh, and you look fierce! I always thought that cardio is very important in exercise. It’s so important to do cardio. I know how good these exercises are for your heart. I like the concept of this workout. It’s great that you can do it at home. Will have to try it out. Good thing I read this right before I started my work out! Going to be doing these for sure! I love that these exercises can be done without a gym. I will have to try these moves out. I have been looking for a new routine to try. I love your workout outfit! It fits you like a glove. The workout for this week is easy enough to do, thanks! I need some exercises to improve my cardio. Looks like a great workout to start the day with. Going to try this! I LOVE the pants! This is a great concept for people like myself who cant commit to working out for hours. I will definitely be using this website for great workout routines. Wonderful post as always – I love the outfit and your results but still not enough to get me doing all of this! 🙂 Sorry, I’m just not into this level of fitness. Mountain climbers are a killer, I tell you! Wow, I’m getting tired just watching these! I really like that these give a great workout without a gym membership though! um. your body is my inspiration. thank you for giving me tomorrow’s workout! this is a great workout! And something I can do at home easily. Great workout you have. I really like the capris. They do look comfy. Great workout help and inspiration which I need! Love the motion animations they are even more helpful! Also your workout wear looks great! A good sports bra is priceless! I am worn out just watching your workout. It looks like it’d make some great improvements on the body! That looks very intense. I do love to do HIIT workouts though! This looks like a workout I need to try. My doctor just told me today I needed to try high intensity exercise. You are so fit so I’d be nuts not to try your cardio and other workouts. You have on some cute clothing and they look really comfy. I have to be comfy when I do my yoga. I need to build up to these exercises. The pants are super cute- I love the pocket for your phone. When I go to the gym it’s hard for me to figure out where to put my phone and keys. Love that they have a pocket. Your outfit looks comfortable for exercise being able to move and stretch is a necessity. How awesome is the pocket on those pants! This workout looks amazing! You got an awesome bod. I don’t know if I’ll start this, but I’ll tag it and see if I can get it done. Yes she does! I so need your motivation! Laziness and procrastination has made my body suffer! This workout looks awesome and I love that there’s no equipment required! PS: Great pants! Those pants are great! They look perfect for exercise! I like the pocket for your phone, hook up the ear buds and have great music to listen to! This looks like an intense workout. It looks like you would get some really good results with this exercise workout! What a great post, I love how detailed it is. You look amazing by the way, so strong. They actually have HIIT classes at my gym but I am too much of a wuss to try them. Love your bold workout gear and the added pockets are exactly what I need! I am in desperate need of some new work out clothes that are comfy. I love those capris! They’re really cute and colorful. I think I will go to that site to look at the dresses–as you know–I am not about to start working out!! I love your work out posts. They’re so inspiring. And I could really use some inspiration. I love that you won’t accidentally flash any crack at the gym lol. I know exactly what you mean with other workout pants like these! I have a booty that needs some extra material! I had no idea you were so fit! WOW! Those pants are great for holding your phone. I keep mine in my bra pocket. I try and workout every morning. Some of these exercises I could do. I can’t wait until I can do these types of things again! I miss the gym! Oh, wow, I love skipping the gym some days, but then I feel guilty that I didn’t work out. I can do this rotation and feel good about my workout! Thanks for sharing! That does look intense and effective! I love the phone pocket on your gym pants! I’m exhausted just looking at this rotation! It looks awesome! Do you have a method for keeping which exercise to do and in what order? I’d probably forget! I remember a few years ago I was in shape and able to do these. Now I’m an old woman with back problems so don’t don’t do anything at all. Will it also shave off ten years, LOL! What a fun workout, loved the outfit, too! And the video clips were awesome, great job! I like that you do these workouts without machines. It shows that you can get fit without needing a gym membership. That’s my favorite/least favorite part. There are no excuses…but there are no excuses! Another great set of workout tips. You make it look so easy! Love your Wednesday workout posts. They make get so motivated! Thanks for sharing these tips. Great workout and apparel. I think knees to elbows may be just as evil as burpees though. I am sitting here on the heating pad from a back injury. Now I want to get up and exercise! Wow, I am exhausted just reading this! No wonder my body looks nothing like that! Nice looking workout. My body is hurting by reading this post. I need to take more of my workout outdoors. I will be following posts like these religiously after giving birth to my baby! I miss my flat tummy already. Thanks for another great workout. I love that outfit too! I took the day off from my walking. You are making me feel guilty. I will get up and dance. What a great workout! I love how you added the .gifs to show the exercise. Well that body sure is inspiring. I almost want to go try all those exercises but I think I will just start with the mountain climbers. I love the Spunkwear capri! This is a great routine! 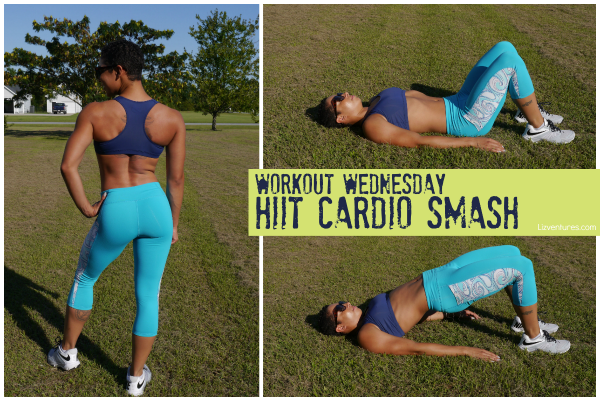 I love workouts that combine strength training with cardio. You are in AMAZING shape!!! You’ve put together a really great workout – I’m not sure i could make it all the way through, but I’ll give it a try! As soon as I get over my hurt knee (I went one way and my knee went the other while exercising) I’m going to try this. Wow, you look incredibly toned and fit! Good job! Oh my gosh you are amazing! I love adding new items to my workout list so that I don’t get bored and this is great! This looks like a great cardiovascular workout. I am going to start doing this once or twice a week. I love these workout articles you’ve been doing lately. Throwing the videos in makes it easy to get an idea of what to do. The video clips help a lot. Many times I glance through magazines and they show step by step instructions on how to do a specific exercise and those are hard to follow. The Visuals are awesome. That is the cutest outfit! Thanks for sharing these workouts with the clips. I’ve got them all bookmarked for reference. Great post! I love the graphics you used, so cool! I love these workouts you’ve been posting. The video clips really make it easy to understand the movements and how to do them. Oh my, really shouldn’t have clicked on here while I am scoffing a biscuit! You look incredible. I must admit, when I am working out the only thing that brings amazing results is HIIT training, however just reading the words brings me out into a cold sweat lol! I really appreciate the video clips as well. I am a visual person so I need to see the exercise in action to “Get it”. Loving your mini video clips! Makes it so much easier to understand how to do the exact workout. I absolutely love and applaud your workout gear! I get tired just seeing the video of the mountain climbers! And the jumping jacks. I have 3 small children with me 24/7 and I’m expecting. Exercise for me these days is very limited, and typically involves someone hanging off of one or both legs. I look forward to getting back into things I enjoy like running when they get older and don’t need as much attention! Your GIFs are so handy, I’ve not seen my PT in such a long time (I probably won’t for a while) so it’s been great reading your posts and keeping active when I get back from work. This looks like an amazing cardio workout. I love the pants. I will have to try a few of these moves. I’ve got to start working out especially a cardio workout as I’m not getting any younger. I need you to move closer to me! You would totally keep my motivated! I have a goal to get in shape by next summer because we are saving for a trip to hawaii! I forgot to add that I wanted the pants for the place to put the cellphone besides my water bottle and my cellphone I don’t bring anything with me when I work out. I get a ride from a buddy to and from every time we work out together she tells me I need to stop working out in sweat pants but I too have thick legs. The pocket does fit an iPhone 6 Plus. They are made form high quality yoga fabric so they stretch to fit who is wearing them!! I need a pair of pants like those and that top when I work out at jazzercize. Every Monday Wednesday and Friday I work out. Working out has really helped me get healthier and feeling better. I had no idea they still did Jazzercise. I want to channel my inner Olivia Newton John and try it, too! Fun! You can find the capris Chanelle is featuring here: http://www.spunkwear.com/category-s/1915.htm Perfect for your next Jazzercise class! You’ll be sure to stand out and be complimented on your bright, fashionable jazzercise outfit! Mountain climbers are my nemesis. You would totally laugh at me if I told you how many times I had to do them to get the coordination down LOL. I was a hot mess for a long time with those.